Research is fundamental to the SoMAS mission. The research conducted at SoMAS seeks to understand the way the marine, atmospheric and terrestrial environments function, as well as the effects and impacts of human interactions with these systems. These problems all require knowledge from multiple disciplines and the School of Marine and Atmospheric Sciences encourages interdisciplinary research. Many of our faculty pursue research in collaboration with scientists at other University departments as well as with scientists from academic institutions around the country and the globe. Unlike many academic institutions, we do not have traditional departments at SoMAS. What we do have is a large number of faculty and students who work together to better understand our planet. All SoMAS faculty are expected to maintain an on-going research program that meets the highest standards of scientific inquiry and to regularly publish the results of their work in refereed scientific journals and other outlets. Research at SoMAS is generally carried out by a team headed by a faculty member that includes his/her graduate students, often aided by one or more undergraduate students. Some of the larger projects employ full- or part-time research technicians and/or postdoctoral associates. Research at SoMAS is externally-funded. Our faculty have a well-deserved reputation for success in securing grants and contracts from a wide variety of sponsors at the federal, state, and local levels. Among the most frequent and important sponsors of research at SoMAS are several U.S. federal agencies: National Science Foundation (NSF); National Aeronautics and Space Administration (NASA); National Oceanic and Atmospheric Administration (NOAA); Department of Energy (DOE); Environmental Protection Agency (EPA) and the Office of Naval Research (ONR). Jackie Collier, an associate professor in the School of Marine and Atmospheric Sciences (SoMAS) at Stony Brook University, is studying tiny organisms called labyrinthulomycetes with the hope of making a big impact on understanding how the smallest marine life in our oceans affects the global carbon cycle. Collier is principal investigator on an experimental model system that has received funding from The Gordon and Betty Moore Foundation’s (GBMF) Marine Microbiology Initiative (MMI). Her team includes Joshua Rest, Department of Ecology and Evolution, Stony Brook University; Daiske Honda, Department of Biology, Konan University, Japan; and Thorsten Reusch, Helmhotlz Centre for Ocean Research, Germany. The grant is part of The Moore Foundation’s overall $8 million investment to support scientists worldwide to accelerate development of experimental model systems in marine microbial ecology. Collier is among more than 100 scientists across 33 institutions to collectively tackle the challenge of developing methods to bring experimental model systems to the ocean. The genetic tools generated in this effort will allow researchers to more easily disrupt the activities of microbial genes to understand how these organisms function in marine ecosystems and provide the capability to ask scientific questions in ways not currently possible. Model systems, such as the mammalian gut bacterium E. coli for microbiology and the fruit fly for biomedicine, have been invaluable for deciphering complex biology. But in the world of marine microbial ecology, there are very few model systems that enable scientists to deeply explore the physiology, biochemistry and ecology of marine microbes, which are key drivers of the ocean’s elemental cycles, influence greenhouse gas levels and support marine food webs. Collier explained that oceanographers understand relatively well the “light side” of the marine carbon cycle: photosynthesis performed by microscopic phytoplankton that convert inorganic carbon dioxide into the organic carbon that provides food for marine food webs, including all the fish we eat. It is the “dark side” — respiration of heterotrophic marine organisms that returns carbon from organic forms back to carbon dioxide — that requires much more research. Collier and her team will attempt to determine the functions of specific genes by manipulating their expression and/or activity in the lab. They will use genome sequences to identify elements that can be used to regulate the expression of reporter and marker genes, and will find the best way to introduce foreign DNA into diverse labyrinthulomycetes. Stony Brook University Professors Josephine Aller and Daniel Knopf in front of microscope ice nucleation apparatus and phytoplankton culture. Scientists believe that the thin film on the ocean’s surface, which is involved in the formation of sea spray, holds many mysteries that impact our atmosphere and world. A team of Stony Brook University and international researchers may have discovered one key role of this thin layer. They found that biogenic materials in the layer may affect ice cloud formation and thus climate on a global scale, particularly when other known ice forming particles such as mineral dust are scarce or absent. Their findings are detailed in a paper published in Nature. Sea spray aerosol, containing salt and various organic compounds produced by phytoplankton and other microorganisms in surface ocean waters, is emitted by the bursting of bubbles formed by breaking waves and is one of the major sources of particles in the atmosphere. The research groups of Daniel A. Knopf, PhD, in the Institute for Terrestrial and Planetary Atmospheres in Stony Brook’s School of Marine and Atmospheric Sciences (SoMAS), and Josephine Aller, PhD, of SoMAS, are working to unravel the complicated relationship between microorganisms in ocean surface waters, organic compounds in sea spray, and ice cloud formation, which in turn affects precipitation and climate. In the paper, “A marine biogenic source of atmospheric ice-nucleating particles,” the research team studied the source of marine ice nucleating particles through the use of field instruments during several oceanic cruises, laboratory ice nucleation measurements, and state-of-the-art synchrotron X-ray single particle analysis, using facilities at the Lawrence Berkeley National Laboratory’s Advanced Light Source. Ice formation initiated by sea spray aerosol particles as observed using the Knopf ice nucleation apparatus coupled to optical microscopy. The ice crystals grow (panels left to right) as relative humidity is increased. Professors Knopf and Aller with their students showed that dissolved organic material released by a common ocean phytoplankton species grown in the laboratory could form ice under temperatures and relative humidity typical of the atmosphere. The Stony Brook team further demonstrated that field collected surface ocean microlayer film material capable of ice nucleation is physicochemically similar to the organic material released by the laboratory culture. These findings, in combination with ice nucleation experiments using the Arctic microlayer samples, led the international team to conclude that biogenic ice nucleating particles present in material released by phytoplankton are a good candidate for the source of activity observed in the sampled microlayers. It is known that sea spray aerosol is often associated with phytoplankton material. This suggests that some fraction of sea spray aerosol particles will be capable of forming ice in the atmosphere. Armed with these data, the international team developed a global model incorporating sea spray aerosol emissions and ice formation efficiencies measured in the laboratory to unambiguously link phytoplankton with particles that form ice in the atmosphere. International research team members involved in the study come from 11 universities or institutions in the United States, Canada and Europe. The research is supported in part by the National Science Foundation and the U.S. Department of Energy. (Left to right): Stony Brook University School of Marine and Atmospheric Sciences Professor Christopher Gobler, PhD and graduate students/Pond Stewards Jennifer Jankowiak and Ryan Wallace launch research project on Georgica Pond water quality, Wainscott, NY. EAST HAMPTON, N.Y., May 20, 2015 – Stony Brook University has partnered with a group of homeowners from the Georgica Pond community, and the East Hampton Town Trustees, to form a public-private partnership to address water quality issues on the east end of Long Island. Local residents have raised $359,000 to support the research project, which will investigate the causes of environmental degradation and the toxic algae blooms observed in Georgica Pond over the last several years. Research will be led by Dr. Chris Gobler, a professor at Stony Brook University’s School of Marine and Atmospheric Sciences. Based on the research findings, the partnership will work closely with the Nature Conservancy to develop a plan of action to remediate the Georgica Pond eco-system. This plan will also help inform other communities in Long Island facing similar water quality issues. In recent years, the pond has experienced elevated levels of toxic algae blooms and dangerously low oxygen levels, which have posed a serious threat to the local eco-system. In 2012, a small dog died after drinking from the pond. An autopsy revealed levels of cyanobacteria in the dog’s stomach that led to neurotoxic shock and eventual death. Testing by Stony Brook in the summer of 2014 revealed high levels of toxic algae leading the pond to be closed for the first time ever. This closure has had a negative impact on many including summer visitors and local residents, who consider the pond an integral feature of their community. Several Georgica Pond homeowners – led by Anna Chapman, Priscilla Rattazzi, and Annie and John Hall – have contributed funds to support Dr. Gobler’s research. Anna Chapman commented that the research project marks a first small step towards addressing a large-scale problem across Long Island. The $359,000 research project will focus on investigating the source of pollution in the pond. One of the key elements of the project will be the installation of a telemetry device that allows for continuous monitoring of multiple water quality indicators, such as the level of algae and oxygen in the water. The device will also record and send data to a web address on an ongoing basis for easy monitoring. In addition, researchers will be sample ground water and other tributaries to the pond. Finally, a graduate student will be appointed from Dr. Gobler’s lab to act as a “Georgica Pond Steward” to oversee the data collection and analysis. A new prediction model tailored to forecast the number of tropical cyclones that could hit New York State in a given season has been developed by three Stony Brook University professors. For the coming Atlantic hurricane season, June 1 through Nov. 30, their forecast is for below-normal activity for tropical storms and depressions, hurricanes and post-tropical storms. Over the past 35 years, the number of storms hitting the state has run from zero to two a year, said Hye-Mi Kim, assistant professor in the School of Marine and Atmospheric Sciences. This year there’s a 19 percent probability, with 43 percent being the average, for one or more storms hitting the state, said Kim, who developed the new forecast approach with professors Edmund K.M. Chang and Minghua Zhang of the School of Marine and Atmospheric Sciences. Their article on the model was posted Thursday on “Weather and Forecasting,” an online journal of the American Meteorological Society. Their prediction, issued in February with a June update, is in keeping with a broader Colorado State University outlook released April 9. The outlook indicates a well-below average Atlantic-basin hurricane season, based in part on a likely moderate to strong El Niño event, the warming of waters in the tropical Pacific, which can ultimately influence weather worldwide. Historically, El Niño is associated with the formation of fewer tropical storms in the Atlantic. Looking at New York, there’s a high correlation between Pacific sea surface temperatures and the number of tropical cyclones that hit the state, Chang told attendees of the meteorological society’s annual meeting in January. Development of the Stony Brook model was funded to the tune of about $18,000, by the New York State Resiliency Institute for Storms & Emergencies, created in the wake of superstorm Sandy, Kim said. Forecasts for the state in coming years would be dependent on possible funding, she said. Although Colorado State and NOAA’s Climate Prediction Center make annual calls on expected hurricane activity in the Atlantic basin, a more targeted forecast for a wider range of storms would be helpful to emergency managers in New York, the article says. “Even a perfect basin-wide forecast is of limited value” for New York, as the correlation between state and basin-wide statistics is low, the article says. In the past 35 years, New York has been hit with 18 tropical cyclones, just one of them — Gloria in 1985 — technically a hurricane, Chang said. A hurricane is a tropical cyclone with sustained surface winds of at least 74 mph. All but two “provided high-impact weather,” he said, such as high winds, heavy precipitation and storm surge. via Stony Brook professors create hurricane prediction model for New York State – Newsday. Satellite image of a hurricane that depicts its size. A team of scientists including Minghua Zhang, Dean and Director of Stony Brook University School of Marine and Atmospheric Sciences (SoMAS), have found that the size of tropical cyclones is controlled by their underlying sea-surface temperatures (SST) relative to the conditions of the mean SST within the surrounding tropical zone of the storms. Their findings, published early online in Nature Communications, imply that under a warmer climate, the size of tropical cyclones (including hurricanes), are not based on the absolute value of SST alone. Scientists believe that the size of cyclones (total rainfall area/radius) is likely controlled by two conditions: the intensity of the storms and the SST. But in this paper, titled “Tropical cyclone rainfall area controlled by relative sea surface temperature,” the research team examined relative conditions and found that aspect to be a more accurate predictor of the tropical cyclone size. “This research was conducted in the context of climate change, and our findings help us understand what controls the sizes of these storms and what measurement data are needed to better predict the impacted areas they cover,” said Professor Zhang, who conducted research on the theoretical explanation of the relationship between the tropical cyclone size and SST. The researchers analyzed 1,142 tropic cyclones worldwide by using high resolution space-borne radar and microwave measurements of precipitation aboard NASA’s Tropical Rainfall Measuring Mission (TRMM) satellite and tropical cyclone track data from the International Best Track Archive for Climate Stewardship22 program. They investigated the controlling factors of each of the tropical cyclone sizes and found that the relationship of the cyclone sizes with the intensity of the cyclones, combined with the absolute values of SSF together are weak, but the relationship between the relative values of the SST and the cyclone sizes is strong. “We were able to also provide a theoretical explanation to this strong relationship with relative SST and confirmed the results in numerical model simulations,” added Professor Zhang. The team conducted the numerical experiments using the global high-resolution climate model developed at the Geophysical Fluid Dynamics Laboratory (GFDL) of the National Oceanic and Atmospheric Administration (NOAA) and Princeton University. Paper co-authors and investigators include Yanluan Lin, lead author, from the Tsinghua University in China, and Ming Zhao of the GFDL. Professor Minghua Zhang, right, and graduate student Tingyin Xiao, discovered that industrial emissions of aerosols over the last 100 years dramatically changed the atmospheric asymmetry between the North Atlantic and South Atlantic and thus the relationship between temperature and precipitation in the northern tropics. Stony Brook, NY, February 9, 2015 – An international team of scientists, including Minghua Zhang, Dean and Director of Stony Brook University’s School of Marine and Atmospheric Sciences (SoMAS), has found that man-made aerosol emissions from industrial processes have changed the relationship between temperature and precipitation in the northing tropics. The findings, published early online in Nature Geoscience, may help to indicate the shifts in seasonal rainfall in Central America, which is critical for agriculture in the region. The team reconstructed rainfall patterns and temperature over 450 years by analyzing the chemical composition of a stalagmite recovered from a cave in Belize in Central America. Stalagmite in the cave was formed through deposition of calcium carbonate and other minerals, which precipitated from mineralized water solutions. These water solutions contain oxygen and carbon. The team used the oxygen and carbon isotopic ratios from each layer of stalagmite deposits to recover the cumulative signals of climatic and hydrogeological variations over the past 450 years that include rainfall and temperature. Because of the unique seasonal variation of precipitation in Belize, the researchers were able to accurately date the layers of deposits. Professor Zhang and Tingyin Xiao, a Stony Brook SoMAS graduate student, conducted research that found out-of-phase relationships between temperature and rainfall within the last 100 years in the northern tropics that is contrary to how the atmospheric dynamical system is expected to work. The stalagmite analysis indicated a shift in the relationship between temperature and rainfall after the industrial revolution. The team then explained that aerosols from industrial emissions have changed the hemispheric contrast of radiative energy between the northern tropics and southern tropics that shifted the relationship between temperature and rainfall. In the paper, titled “Aerosol forcing of the position of the intertropical convergence zone since AD 1550,” the researchers also identified a substantial drying trend from 1850 onwards, coinciding with a steady rise in sulphate aerosols building in the atmosphere as a result of burning fossil fuels during the European and American Industrial Revolution. Professor Zhang explained that sulphate aerosols from emissions moderated temperatures in the Northern Hemisphere by reflecting the Sun’s radiation. This resulted in the Intertropical Convergence Zone – a tropical rainfall belt near the equator – to be shifted toward the warmer Southern Hemisphere, which leads to drier conditions in the northern tropics. The international research team included scientists from Durham University, Stony Brook University, the University of New Mexico, Pennsylvania State University, Northern Arizona University, ETH Zurich, and the Potsdam Institute for Climate Impact Research. via Study Reveals Industrial Aerosol Emissions Has Changed the Relationship Between Temperature and Precipitation in the Northern Tropics – Stony Brook University Newsroom. As part of their research program in sedimentary biogeochemistry, Profs. Qingzhi Zhu, Robert C. Aller, and their students develop and utilize a range of sensors that allow high resolution 2-D imaging of dissolved constituents in marine sediments. 3-D reconstructions of compositional patterns are obtained by tomographic interpolation of the 2-D images. Measuring these patterns and relating them to larger scale behaviors of an ecosystem, for example, the mass flow of nutrients from sediments to overlying water in an estuarine environment, are challenging practical and theoretical problems. One of their unique sensors reveals the complex, time-dependent distributions of H2S (hydrogen sulfide), an important metabolite of anaerobic bacteria in marine sediments and a central component of the sulfur cycle (Zhu and Aller, 2013, Mar. Chem.). This sensor and its potential applications have recently been featured by the National Science Foundation in its major research highlights (http://go.usa.gov/yAT5). Previously available hydrogen sulfide detection methods were limited in their capabilities, as there wasn’t a sensor able to detect both two-dimensional, in-situ distributions of hydrogen sulfide and its dynamics in the environment. The sensor directly demonstrates how the activities of relatively large animals such as worms and clams that live in marine sediments impact H2S distributions, sulfide mineral formation conditions, and the dynamic biogeochemical interactions associated with coupled anaerobic and aerobic decomposition of organic matter (Figure 1). Worm burrows (from the common ragworm Nereis diversicolor) in Flax Pond sediment (left; arrows) and the simultaneous image of hydrogen sulfide concentrations (right). Ventilation of burrows with overlying water oxidizes H2S in surrounding sediment, creating complex, dynamic concentration distributions. via Seeds of Hope for Shinnecock Bay – Stony Brook University Newsroom. 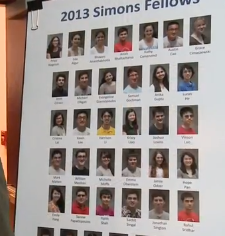 Twenty-two high school students who worked with Stony Brook University faculty were named among the 300 semifinalists in the national 2014 Intel Science Talent Search competition. The School of Marine & Atmospheric Sciences mentored 3 of these students.